Gas is convenient, but it really is no match for coal as far as flavor goes. And to be honest, gas takes a bit of the fun out of grilling. There’s just something enjoyable about firing up the old Weber. Since we could only do it when the weather was nice, it gave us something to look forward to. And I knew my food would have that light, smokey goodness that reminds me of cowboys and sleeping under the stars. With gas, I just have to push a button and wait 5 minutes. Boring! No more something-to-look-forward-to. Okay, I’m romanticizing just a bit, but you die-hard coal fans know what I mean. I just happen to be smoking some fish and chicken, and since I didn’t want to waste the heat, I threw on some corn. The smoke had already died down, but the corn still took on a light smokey flavor, which came through in the soup. Another reason to look forward to firing up the old Weber. No charcoal grill? No problem! Try broiling until it takes on a little color. Corn is phenomenal this time of year so you can’t really go wrong. Start by sauteing the celery, onion and garlic in a little olive oil. Once they are softened, add the corn (reserve a half cup or so for serving), potato, broth, water and lime juice. Bring to a boil, cover and simmer until the potato is softened, about 20 minutes. (It is completely okay to simmer for longer since you will be pureeing the soup.) Adjust seasoning, if necessary. Puree the soup and pass it through a fine-mesh sieve. Discard the solids. Add back in the reserved kernels. If the soup is too thick, use more broth or even a little bit of cream to thin it out. Check seasonings again. At this point it’s ready to serve, however, I like to let soups sit for a couple of hours to overnight for the flavors to meld. Your call. 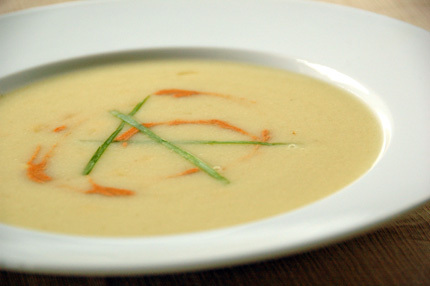 This soup is awesome as is, but it’s nice to add a little something to contrast with the sweetness of the corn. We like crumbled blue cheese. Flaked, smoked salmon works well too. Both have a savory-saltiness that compliments the corn’s sweetness. Or go simple and add just a small dollop of sour cream. Or sour cream mixed with adobo (as seen in the picture). Or avocado. The possibilities are endless! Oh, and it can be served chilled too!